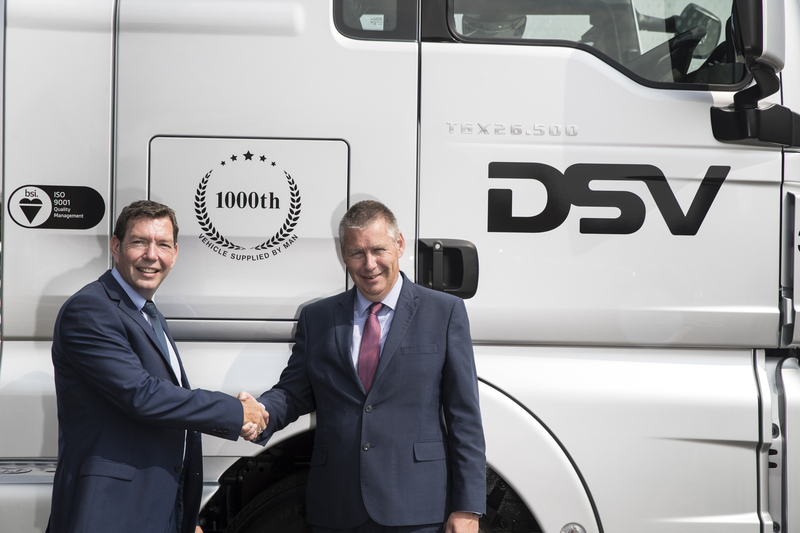 Global Transport and Logistics provider DSV, a subsidiary of DSV A/S, has just taken delivery of their 1,000th UK MAN Truck. Through their own strategically placed hubs, DSV plan and route the daily delivery of full load, part load and groupage shipments both nationally and to and from Europe. DSV operate more than 20,000 trucks on the road each day across Europe, with offices in more than 80 countries worldwide, DSV offer global import and export services via road, air and sea. DSV’s latest fleet edition is a New MAN TGX 26.500 6x2 tractor featuring the range topping flagship XXL Cab. Based out of DSV’s Immingham depot it will travel throughout the UK delivering unitised loads. 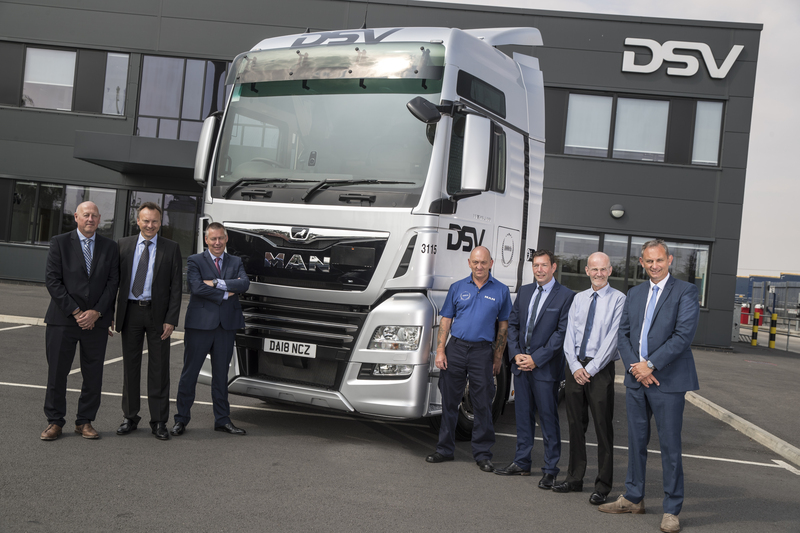 In marking the significance of the 1000th MAN truck to enter service for DSV in the UK, unlike the traditional DSV deep blue livery with white lettering, the new vehicle is painted in a commemorative silver with the DSV logo in black. Keith Northen, Manager, Fleet, Immingham DSV Road division, UK, said: “This vehicle marks not one, but two milestones for DSV here in the UK. Firstly, it is the 1000th MAN truck that we have operated within our UK fleet over the past 20 years, and secondly all 1000 vehicles have been sold to us by the same contact from MAN, Mark Price. “We have a long-term, firmly established and trusted relationship with both Mark and MAN,” Mr Northen expanded. “With over 20 years of experience in specifying and supplying our vehicles, Mark knows exactly what we need and delivers on time, every time. The New TGX 26.500 XXL joins an existing fleet of 172 DSV vehicles, 142 of which are MAN. DSV Commercials located in Immingham, a MAN Truck & Bus franchised service provider, prepare all new DSV vehicles and maintain their own fleet locally, a service that they have provided since 1988. During the preparation process, DSV Commercials fit internal and external fire extinguishers, anderson lead power sockets, palm couplings, tyre pressure information labels and hazardous chemical signs to the grille. The MAN dealer network supply a high level of service and support at other DSV locations throughout the UK. 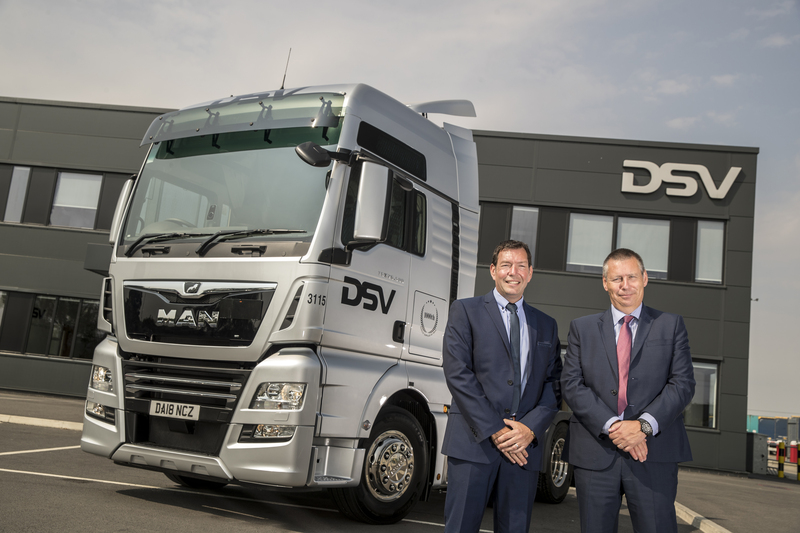 With over the 20 years of partnering DSV with new vehicles and related services, MAN Truck & Bus UK, through their in-house finance function, MAN Financial Services (MANFS) has supplied funding for majority of the 1000 vehicles. 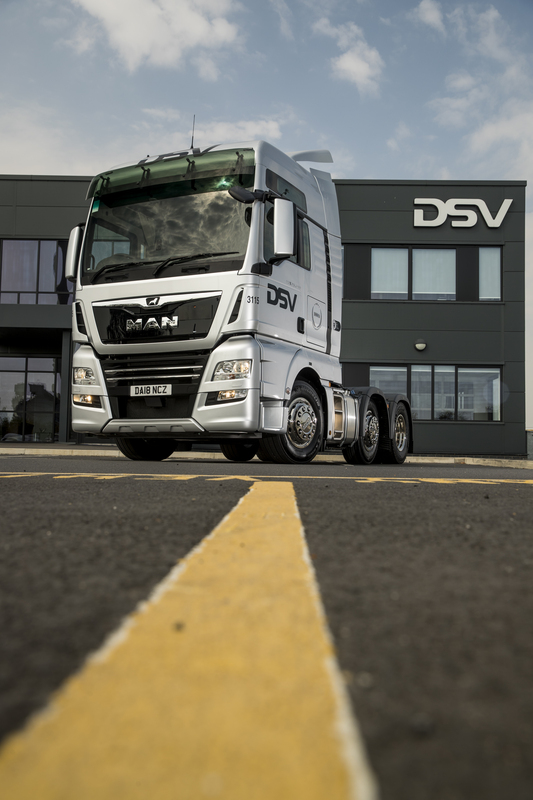 As with all MAN TGX and TGS 4x2 and 6x2 Tractor units and rigids, DSV’s latest fleet addition comes as standard with a MAN two-year “Relax” Gold R&M package, up 300,000kms, this includes bulbs and top ups. Total piece of mind is further supported by the standard TGX 3 year, Fully Comprehensive Warranty, up to 450,000kms. “Covering an average 120,000kms a year our vehicles will be in service for four years, this means that fast, responsive and customer focused back-up is essential. As the flagship of the DSV fleet the TGX has been specified with an enhanced level of driver comfort, these features include: MAN’s Style Package, leather seats and cab trim, satnav with 7-inch colour screen and air-conditioning. Safety, a key area for DSV, has been enhanced with the fitment of MAN EBA braking, Lane Guard and cornering lights. Ensuring maximum efficiency the TGX has been fitted with MAN EfficientRoll and EfficientCruise – which recently proved a 9 per cent improvement in fuel consumption, a sliding 5th wheel – helping maximise aerodynamic efficiencies and, Alloy wheels fitted with Michelin Eco tyres. DSV is listed on NASDAQ OMX Copenhagen, and included in the C20 index as one of the 20 most actively traded shares on the Copenhagen stock exchange. With 1000 office and logistics facilities, worldwide DVS employs more than 45,000 people.